"Hello Guillermo. I'm attaching the image from Sierra de la Ventana. 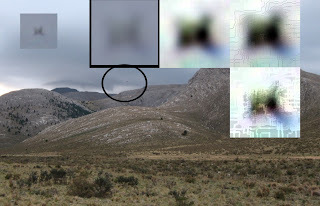 The one that was uploaded to Planeta UFO did not define its contour properly, but an explanation for this can be found in the image's format, which was taken at 1/30 sec, rather low, and the hyperfocal is somewhere around 3.74 meters (this is the point of maximum clarity in the photo). Nevertheless, refinement begins to yield a contour that could correspond to that of a bird in flight. Please bear in mind that the aperture's low speed must be taken into consideration a long with the distance of greatest clarity (barely 3.74 meters). If it is a bird, it corresponds to the clarity with which the trees on the hill can be seen. This was what I was able to glean. See below the information on the photo, distances and speeds. This information may be incorrect if the image has been resized or modified in any way." Inexplicata thanks Guillermo Gimenez and Jorge Figueras for this information. Spain: Remembering the "Incident at Palomares"